Do you still remember Michael Jordan’s shot over Byron Russell during the 1998 NBA Finals? Yes, that shot could have been Michael Jordan’s final shot in the NBA had he decided against making a comeback with the Washington Wizards. Nevertheless, that shot was a part of his legacy, making it worthy of a shoe model that was named after it! 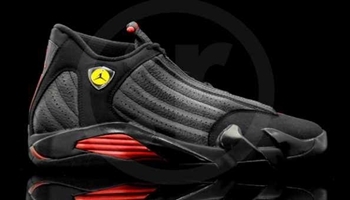 The Air Jordan 14 will be released soon in an impressive black/varsity red colourway, which will be known as the Air Jordan 14 “last shot” edition! This silhouette is already making a lot of noise in the market so start saving money and watch out for its release!